One year ago, I removed a few branches from my large dragon tree. One of the cut areas is now showing a small amount of the very dark “dragon tree blood” resin. 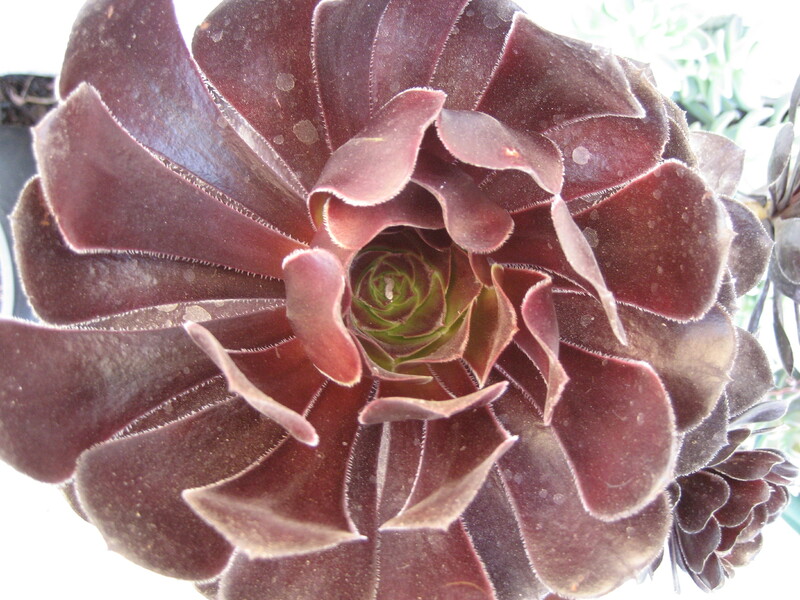 It is so very striking, a very deep red. The tree is very healthy and robust. This is the first time I’ve seen evidence of the famed “dragon’s blood.” One of my beloved tree’s mysteries has been revealed. Stunning. It’s been three years since I was last able to photograph a hooded oriole in my yard. This time, my camera was close at hand to capture an image of this beautiful female. I’ve been hearing its somewhat harsh kek-kek-kek call in my neighbor’s citrus trees for several weeks, initially thinking it might be a squirrel making that sound. With no squirrel in sight, I concluded that it had to be a bird but I needed a sighting to confirm my suspicions. 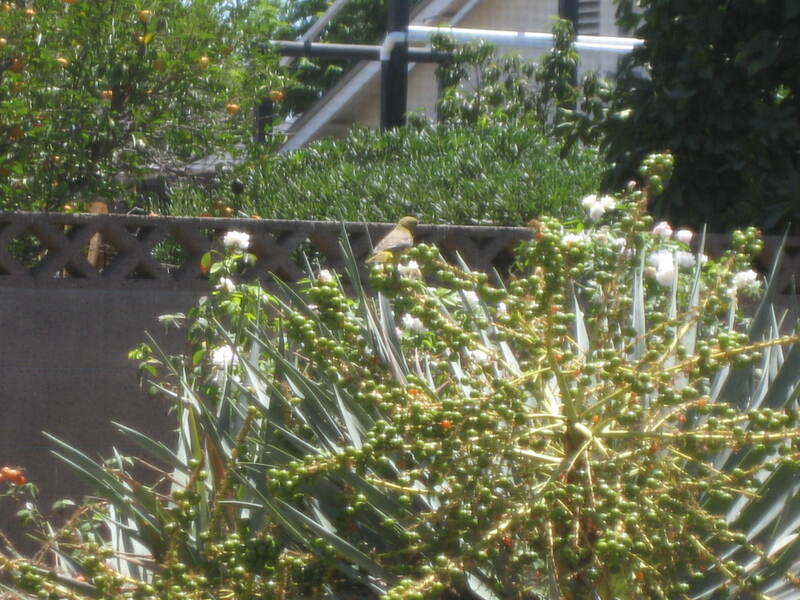 It was again in my neighbor’s citrus trees but I had my camera ready in case in flew into my back yard. 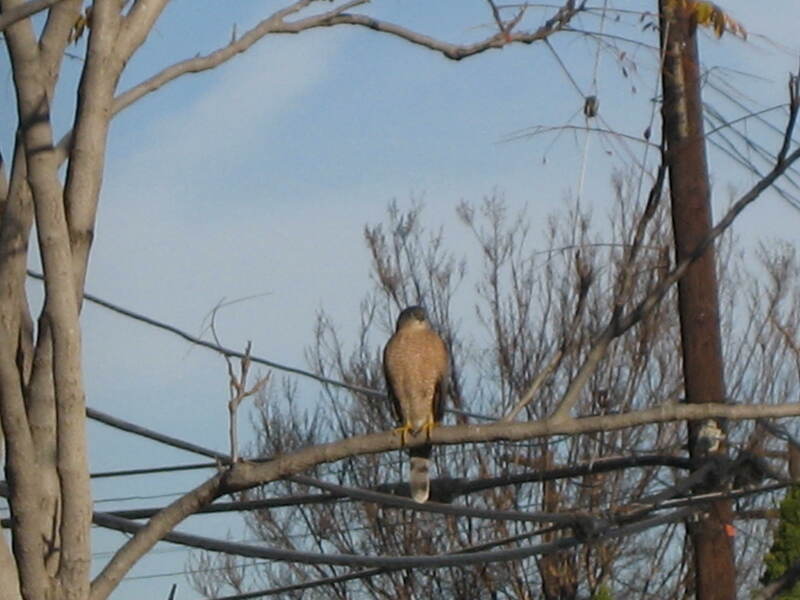 Amazingly, it did find its way here, briefly perching atop one of the seed stalks of one of my dragon trees – she’s in the center of the photo. She looks right at home to me! Dragon Tree Cuttings Are Busting Out of Their Containers! 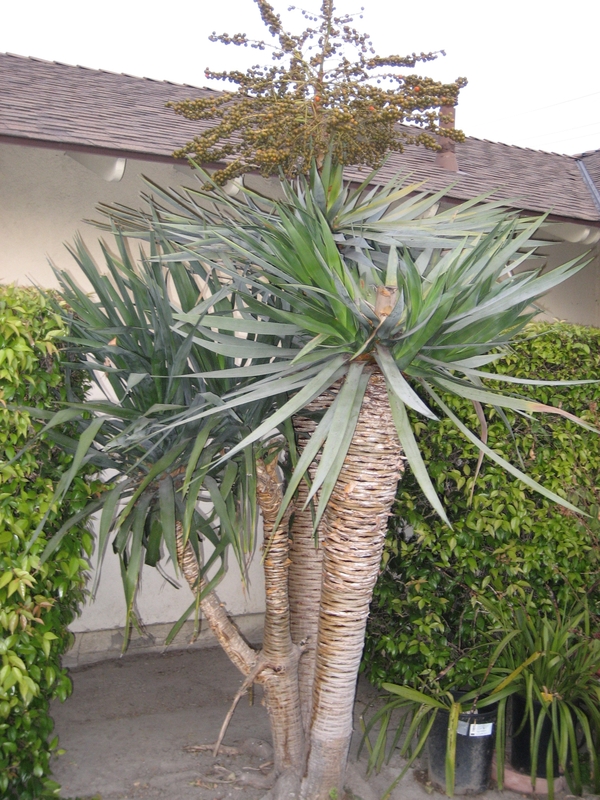 Nearly six years ago, I had several branches trimmed from my oldest, primary dragon tree because they were growing into the roof of my garage. I promptly put the cuttings into 5-gallon plastic containers filled with soil and watered every few weeks and left them in my back yard to enjoy their lives! And enjoy them they did, for I am happy to post these photos of two of these tree cuttings that are now stand-alone trees in their own right. Wow! 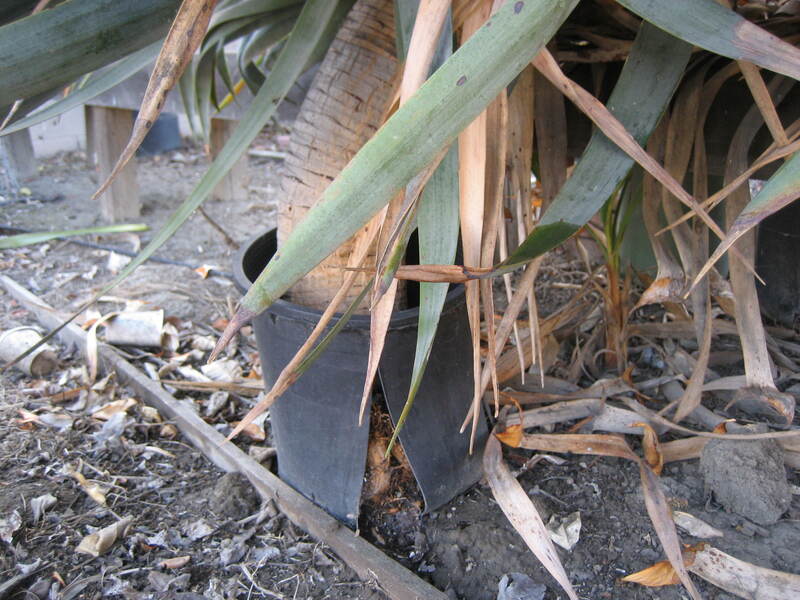 They have grown not very much taller but have grown wider and have established new roots. I will eventually cut away the plastic containers that they have outgrown when it is safe to do so without damaging the trees. The tree cuttings were a bit curved and heavy so I placed them up against a long wood bench to help prop them up while they grew. It’s so exciting to see them grow. One of these cuttings actually produces seed stalks, seeds from which totally new trees are born. It is so thrilling to know that I can propagate these trees from cuttings as well as from these seeds – a very simple process. These trees have a will to survive like I have not seen in most plants and it is inspiring to see that they can adapt to changing conditions, the epitome of resilience. Long live these beautiful dragon trees! This is what the autumn season looks like in my tiny point on the planet! We’ve been having a lot of strong, dry winds whipping through several nearby communities in the past few days. 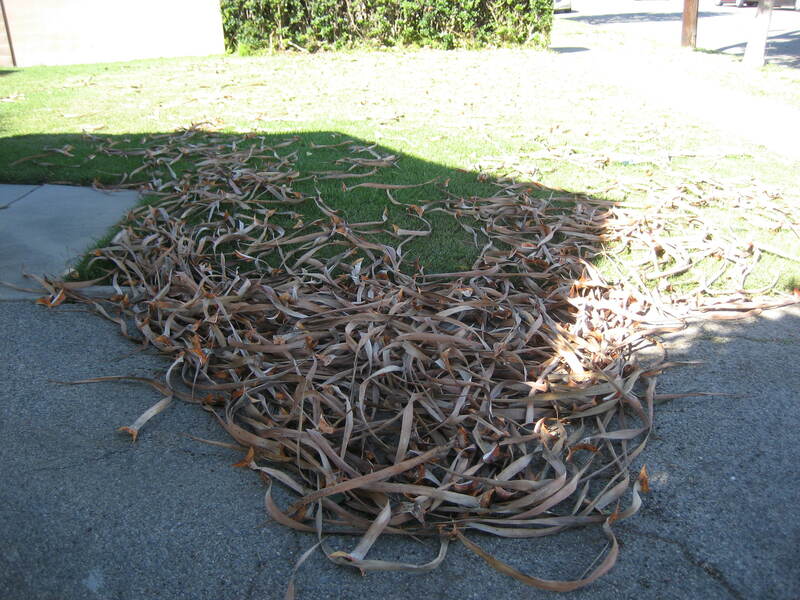 My much beloved dragon tree has shed many dried leaves as a result. Since I am the only one on my street (possibly my whole city) who has this tree, when the winds (hopefully) subside later this afternoon, I will be raking up many of these leaves from my and my neighbors’ yards. The leaves are nearly the length of my arm! But I am lucky, though. I only have to rake leaves. About an hour ago, I was driving through a nearby city and saw that several branches from trees snapped off. I also saw one very large, mature tree uprooted. I only have to do a “heavy raking” just a few times a year, so it’s still low maintenance. This particular tree is decades old and remains the grand lady of my neighborhood all year round! Check out the roots of one of my older dragon trees. Roots are in the center and to the left. The roots slowly but surely find their way into the soil. 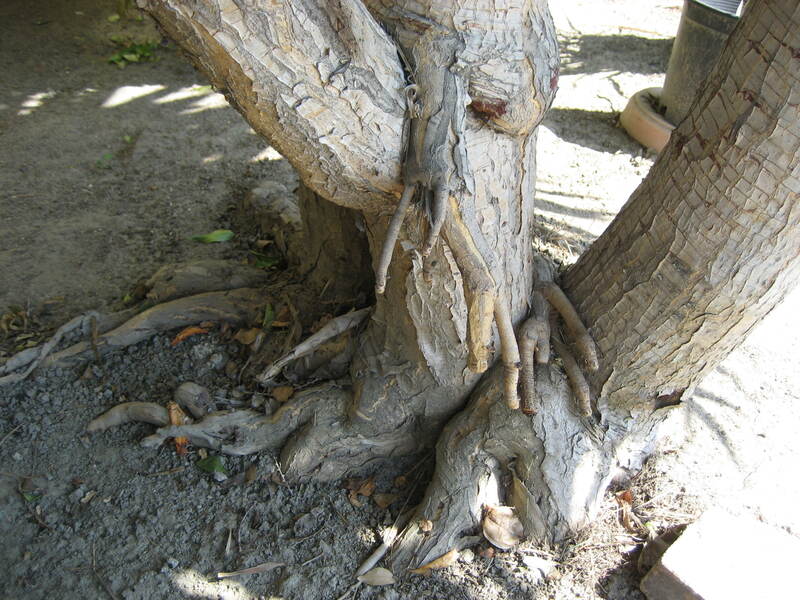 Often, when trees are mature, we miss out on all of the exciting root activity underneath! This is a wonderful opportunity to see the process from the beginning. The trunk of this particular tree is also very beautiful as well. Yesterday, during my flurry of garden maintenance, I removed the dead leaves from this tree. Now it is totally refreshed. I see this tree first thing every morning. I love my dragon trees! Dragon Trees: Ages and Stages! It may seem like these are different plants, but, I assure you, they are not! These are photos of my much beloved dragon trees, i n different stages of development. The very petite tree in the first photo was taken just a few weeks ago and the result of an errant dragon-tree seed germinating in the soil and taking root! Propagating this tree from seed is inexpensive but is a long waiting game (the seeds are contained within the berries of the flower stalks that precede the appearance of berries – see the photo below of my mature tree). Check out the size of this tiny baby tree, relative to the size of the cinder block behind it. 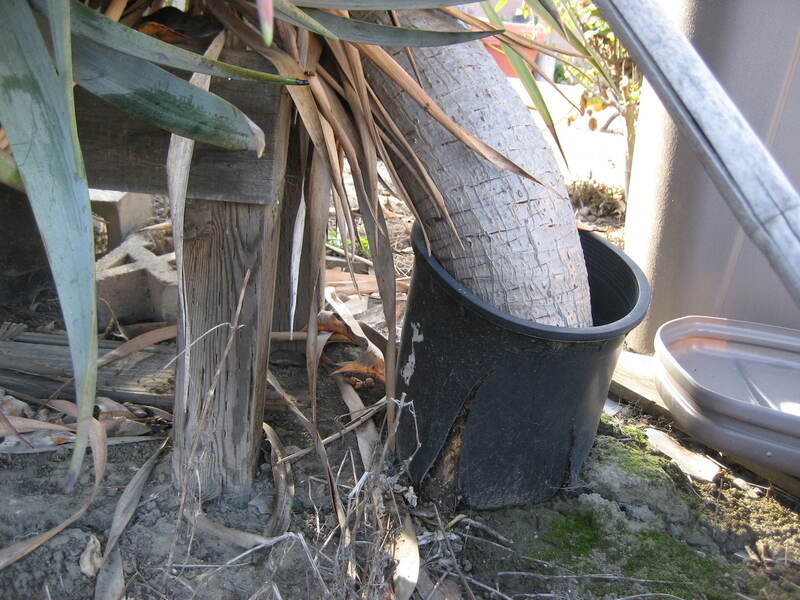 The other three photos are a bit older: the second photo is a dragon-tree cutting taken from my very mature tree and is thriving in a container. This cutting (and similar cuttings) have developed roots and settling in nicely in their containers. Cuttings are a good way to propagate this tree, although the cuttings can be quite heavy! I recommend taking cuttings from your mature tree in inconspicuous portions of the tree, to maintain the symmetry and beauty of the overall tree. The third is a young but tall dragon tree on the side of my house (I am not sure of its origins: if from a seed from the mature tree, a cutting from the mature tree, or a separate, unrelated dragon tree planted there on purpose). 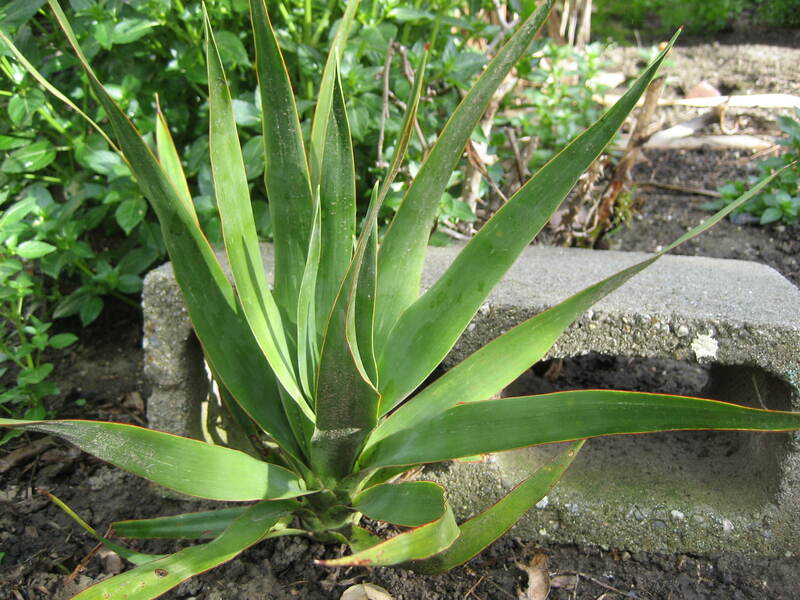 When I first purchased my house, this particular tree was so low to the ground that I thought it was an agave or some other type of plant! Within 10 years’ time, this tree shot up, fairly rapid in tree years, I suppose, but fairly slow in people years! 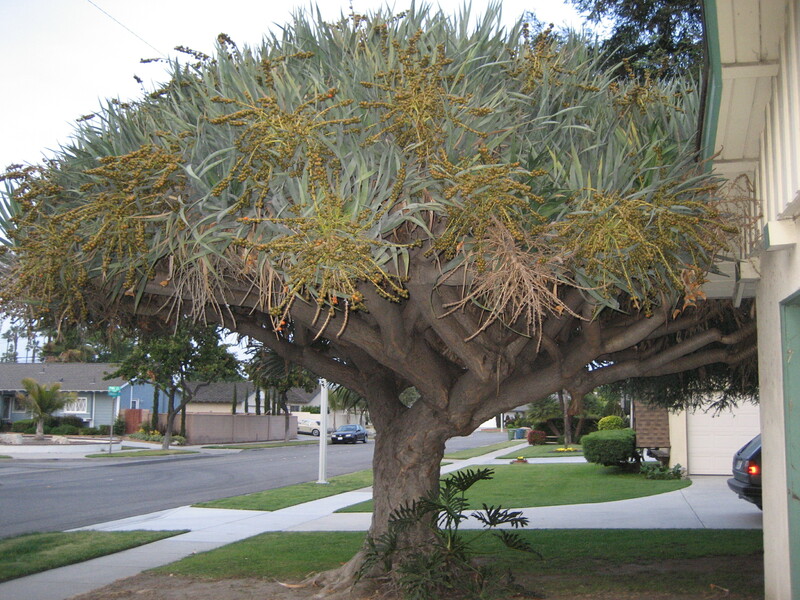 The fourth photo is of my mature dragon tree. Each year, this tree produces flowers and berries, which eventually change from green to orange in color. Birds really LOVE to eat the pulp from these berries and leave the seeds behind, so it can be a bit untidy at times. I want to showcase in one post how this tree develops and how it would look over the course of time. This is a good approximation of what you could expect if you were to grow a dragon tree from seed and planted it outdoors. Compare and contrast! Following up on the last post, here is a photo of my mature dragon tree (aka Dracaena draco), branching. The beautiful branching habit of this incredible tree provides the structure for its dome-shaped canopy. Click on the photo to see how each earlier branch spawned at least 2 new branches, and so on! 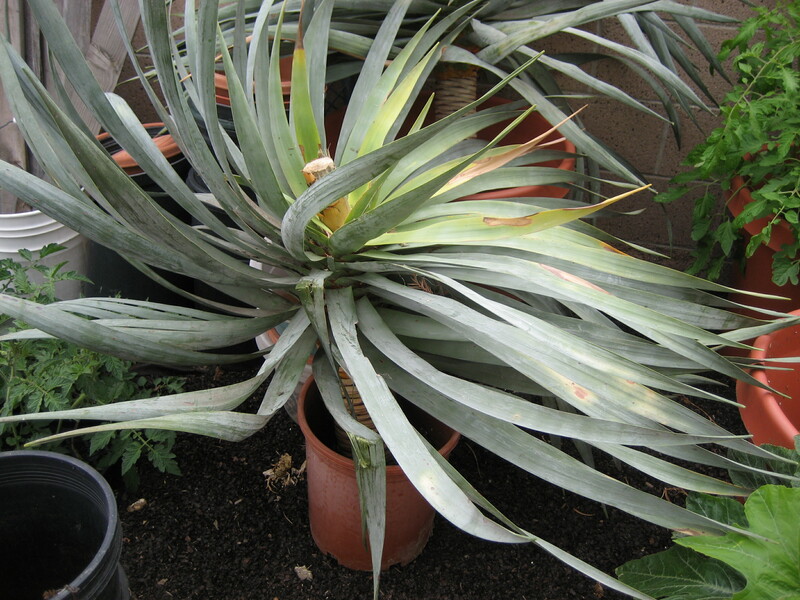 This is one of my dragon tree cuttings, in a petite 5-gallon container. 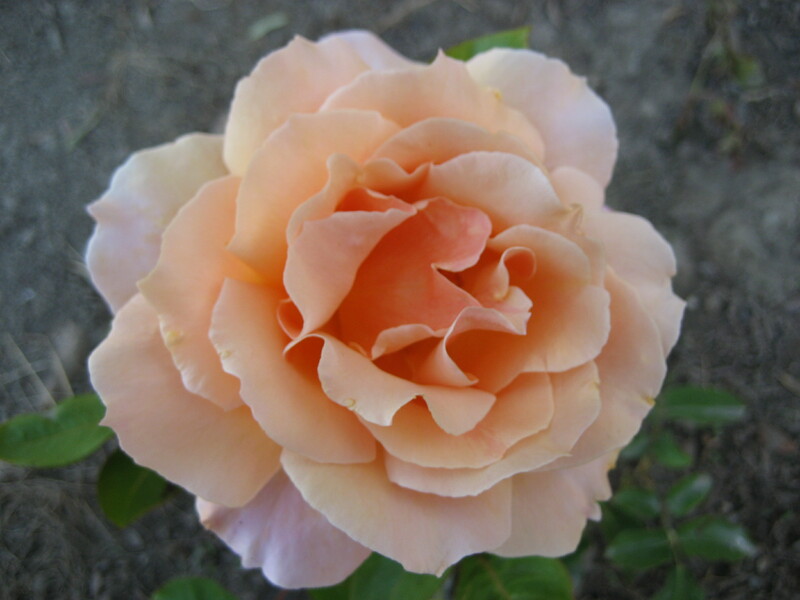 Click on the photo and look at the bottom, slightly left of center – you’ll notice a very healthy root! This cutting was taken nearly one year ago. The wait was definitely worth it. The only care I provide it is water it once a week. 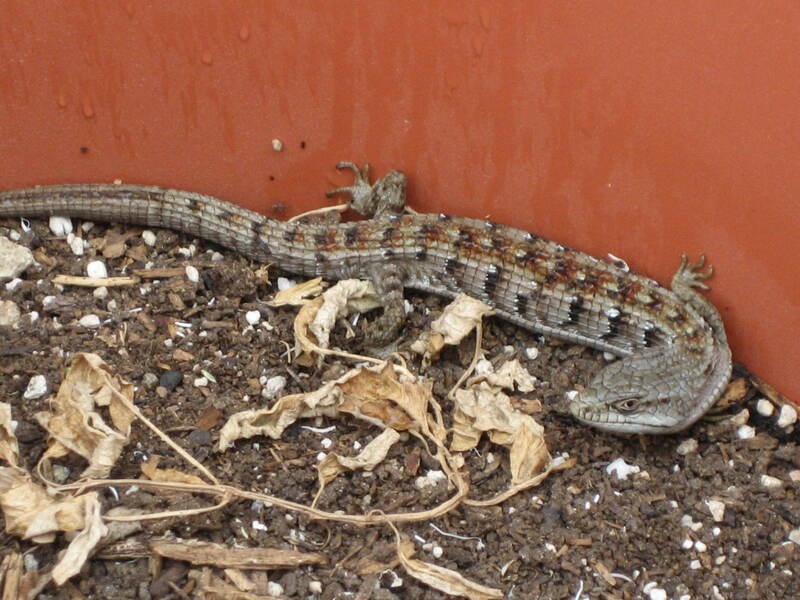 I will have to re-pot this cutting into a larger container, or plant it directly into the ground. I’ll have to decide soon. Hiding behind the large cutting is a smaller dragon tree, propagated from my mature tree’s seed!